A weather brief should be part of any preparation for flight. Here it is important to know your way around aviation weather reporting - what is available and how is it read. In aviation, weather service is a combined effort of the National Weather Service (NWS), the Federal Aviation Administration (FAA), the Department of Defense (DOD), and other aviation groups and individuals. Because of the increasing need for worldwide weather services, foreign weather organizations also provide vital input. While weather forecasts are not 100 percent accurate, meteorologists, through careful scientific study and computer modeling, have the ability to predict the weather patterns, trends, and characteristics with increasing accuracy. Through a complex system of weather services, government agencies, and independent weather observers, pilots and other aviation professionals receive the benefit of this vast knowledge base in the form of up-to-date weather reports and forecasts. These reports and forecasts enable pilots to make informed decisions regarding weather and flight safety. The data gathered from surface and upper altitude observations form the basis of all weather forecasts, advisories, and briefings. There are three types of weather observations: surface, upper air, and radar. Surface aviation weather observations (METARs) are a compilation of weather elements of the current weather at ground stations across the United States. The network is made up of government run facilities and privately contracted facilities that provide up-to-date weather information. Automated weather sources such as automated weather observing systems (AWOS) and automated surface observing systems (ASOS), as well as other automated facilities, also play a major role in the gathering of surface observations. Surface observations provide local weather conditions and other relevant information. This information includes the type of report, station identifier, date and time, modifier (as required), wind, visibility, runway visual range (RVR), weather phenomena, sky condition, temperature/dewpoint, altimeter reading, and applicable remarks. The information gathered for the surface observation may be from a person, an automated station, or an automated station that is updated or enhanced by a weather observer. In any form, the surface observation provides valuable information about airports around the country. Observations of upper air weather prove to be more challenging than surface observations. There are only two methods by which upper air weather phenomena can be observed: radiosonde observations and pilot weather reports (PIREPs). Using radio telemetry, radiosonde observations are made by sounding balloons from which weather data is received twice daily. These upper air observations provide temperature, humidity, pressure, and wind data for heights up to and above 100,000 feet. In addition to this, pilots provide vital information regarding upper air weather observations. Pilots remain the only real-time source of information regarding turbulence, icing, and cloud heights, which is gathered from pilots in flight, through the filing of pilot weather reports or PIREPs. Together, pilot reports and radiosonde observations provide information on upper air conditions important for flight planning. Many U.S. and international airlines have equipped their aircraft with instrumentation that automatically transmits in-flight weather observations through the DataLink system to the airline dispatcher who disseminates the data to appropriate weather forecasting authorities. Weather observers use three types of radar to provide information about precipitation, wind, and weather systems. The WSR-88D NEXRAD radar, commonly called Doppler radar, provides in-depth observations that inform surrounding communities of impending weather. FAA terminal doppler weather radar (TDWR), installed at some major airports around the country, also aids in providing severe weather alerts and warnings to airport traffic controllers. Terminal radar ensures pilots are aware of wind shear, gust fronts, and heavy precipitation, all of which are dangerous to arriving and departing aircraft. The third type of radar commonly used in the detection of precipitation is the FAA airport surveillance radar. This radar is used primarily to detect aircraft; however, it also detects the location and intensity of precipitation which is used to route aircraft traffic around severe weather in an airport environment. Service outlets are government or private facilities that provide aviation weather services. Several different government agencies, including the Federal Aviation Administration (FAA), National Oceanic and Atmospheric Administration (NOAA), and the National Weather Service (NWS) work in conjunction with private aviation companies to provide different means of accessing weather information. The FAA Flight Service Station (FSS) is the primary source for preflight weather information. A preflight weather briefing from an automated FSS (AFSS) can be obtained 24 hours a day by calling 1-800-WX BRIEF almost anywhere in the U.S. In areas not served by an AFSS, National Weather Service facilities may provide pilot weather briefings. Telephone numbers for NWS facilities and additional numbers for FSSs/AFSSs can be found in the Airport/Facility Directory (A/FD) or in the U.S. Government section of the telephone book. Flight Service Stations also provide in-flight weather briefing services, as well as scheduled and unscheduled weather broadcasts. An FSS may also furnish weather advisories to flights within the FSS region of authority. The Transcribed Information Briefing Service (TIBS) is a service which is prepared and disseminated by selected Automated Flight Service Stations. It provides continuous telephone recordings of meteorological and aeronautical information. Specifically, TIBS provides area and route briefings, airspace procedures, and special announcements. It is designed to be a preliminary briefing tool and is not intended to replace a standard briefing from an FSS specialist. The TIBS service is available 24 hours a day and is updated when conditions change, but it can only be accessed by a TOUCH-TONE© phone. The phone numbers for the TIBS service are listed in the A/FD. The Direct User Access Terminal Service, which is funded by the FAA, allows any pilot with a current medical certificate to access weather information and file a flight plan via computer. Two methods of access are available to connect with DUATS. The first is on the Internet through DynCorp at http://www.duats.com or Data Transformation Corporation at http://www.duat.com. The second method requires a modem and a communications program supplied by a DUATS provider. To access the weather information and file a flight plan by this method, pilots use a toll free telephone number to connect the user’s computer directly to the DUATS computer. The current vendors of DUATS service and the associated phone numbers are listed in Chapter 7 of the Aeronautical Information Manual (AIM). A service specifically designed to provide timely enroute weather information upon pilot request is known as the enroute flight advisory service (EFAS), or Flight Watch. EFAS provides a pilot with weather advisories tailored to the type of flight, route, and cruising altitude. EFAS can be one of the best sources for current weather information along the route of flight. A pilot can usually contact an EFAS specialist from 6 a.m. to 10 p.m. anywhere in the conterminous U.S. and Puerto Rico. The common EFAS frequency, 122.0 MHz, is established for pilots of aircraft flying between 5,000 feet AGL and 17,500 feet MSL. HIWAS is a national program for broadcasting hazardous weather information continuously over selected navaids. The broadcasts include advisories such as AIRMETS, SIGMETS, convective SIGMETS, and urgent PIREPs. These broadcasts are only a summary of the information, and pilots should contact an FSS or EFAS for detailed information. Navaids that have HIWAS capability are depicted on sectional charts with an “H” in the upper right corner of the identification box. Figure 1: HIWAS availability is shown on sectional chart. A transcribed weather broadcast is a weather report transmitted continuously over selected navaids. On a sectional chart, a “T” in the upper right-hand corner of the navaid box indicates TWEB availability. TWEB weather usually consists of route-orientated data including route forecasts, forecast outlook, winds aloft, and other selected weather reports for an area within 50 nautical miles (NM) of the FSS or for a 50-mile wide corridor along a specific route. A TWEB forecast is valid for 12 hours and is updated four times a day. Prior to every flight, pilots should gather all information vital to the nature of the flight. This includes an appropriate weather briefing obtained from a specialist at an FSS, AFSS, or NWS. For weather specialists to provide an appropriate weather briefing, they need to know which of the three types of briefings is needed—a standard briefing, an abbreviated briefing, or an outlook briefing. Other helpful information is whether the flight is visual flight rule (VFR) or instrument flight rule (IFR), aircraft identification and type, departure point, estimated time of departure (ETD), flight altitude, route of flight, destination, and estimated time en route (ETE). This information is recorded in the flight plan system, and a note is made regarding the type of weather briefing provided. If necessary, it can be referenced later to file or amend a flight plan. It is also used when an aircraft is overdue or is reported missing. A standard briefing is the most complete report and provides the overall weather picture. This type of briefing should be obtained prior to the departure of any flight and should be used during flight planning. A standard briefing provides the following information in sequential order if it is applicable to the route of flight. 1. Adverse Conditions—This includes information about adverse conditions that may influence a decision to cancel or alter the route of flight. Adverse conditions includes significant weather, such as thunderstorms or aircraft icing, or other important items such as airport closings. 2. VFR Flight NOT RECOMMENDED—If the weather for the route of flight is below VFR minimums, or if it is doubtful the flight could be made under VFR conditions due to the forecast weather, the briefer may state that VFR is not recommended. It is the pilot’s decision whether or not to continue the flight under VFR, but this advisory should be weighed carefully. 3. Synopsis—The synopsis is an overview of the larger weather picture. Fronts and major weather systems that affect the general area are provided. 4. Current Conditions—This portion of the briefing contains the current ceilings, visibility, winds, and temperatures. If the departure time is more than 2 hours away, current conditions will not be included in the briefing. 5. En Route Forecast—The en route forecast is a summary of the weather forecast for the proposed route of flight. 6. Destination Forecast—The destination forecast is a summary of the expected weather for the destination airport at the estimated time of arrival (ETA). 7. Winds and Temperatures Aloft—Winds and temperatures aloft is a report of the winds at specific altitudes for the route of flight. However, the temperature information is provided only on request. 8. Notices to Airmen—This portion supplies NOTAM information pertinent to the route of flight which has not been published in the Notice to Airmen publication. Published NOTAM information is provided during the briefing only when requested. 9. ATC Delays—This is an advisory of any known air traffic control (ATC) delays that may affect the flight. 10. Other Information—At the end of the standard briefing, the FSS specialist will provide the radio frequencies needed to open a flight plan and to contact en route flight advisory service (EFAS). Any additional information requested is also provided at this time. An abbreviated briefing is a shortened version of the standard briefing. It should be requested when a departure has been delayed or when specific weather information is needed to update the previous briefing. When this is the case, the weather specialist needs to know the time and source of the previous briefing so the necessary weather information will not be omitted inadvertently. An outlook briefing should be requested when a planned departure is 6 or more hours away. It provides initial forecast information that is limited in scope due to the timeframe of the planned flight. This type of briefing is a good source of flight planning information that can influence decisions regarding route of flight, altitude, and ultimately the go, no-go decision. A follow-up briefing prior to departure is advisable since an outlook briefing generally only contains information based on weather trends and existing weather in geographical areas at or near the departure airport. Aviation weather reports are designed to give accurate depictions of current weather conditions. Each report provides current information that is updated at different times. Some typical reports are aviation routine weather reports (METAR), pilot weather reports (PIREPs), and radar weather reports (SDs). An aviation routine weather report, or METAR, is an observation of current surface weather reported in a standard international format. While the METAR code has been adopted worldwide, each country is allowed to make modifications to the code. Normally, these differences are minor but necessary to accommodate local procedures or particular units of measure. This discussion of METAR will cover elements used in the United States. 1. Type of Report—There are two types of METAR reports. The first is the routine METAR report that is transmitted every hour. The second is the aviation selected special weather report (SPECI). This is a special report that can be given at any time to update the METAR for rapidly changing weather conditions, aircraft mishaps, or other critical information. 2. Station Identifier—Each station is identified by a four-letter code as established by the International Civil Aviation Organization (ICAO). In the 48 contiguous states, a unique three-letter identifier is preceded by the letter “K.” For example, Gregg County Airport in Longview, Texas, is identified by the letters “KGGG,” K being the country designation and GGG being the airport identifier. In other regions of the world, including Alaska and Hawaii, the first two letters of the four-letter ICAO identifier indicate the region, country, or state. Alaska identifiers always begin with the letters “PA” and Hawaii identifiers always begin with the letters “PH.” A list of station identifiers can be found at an FSS or NWS office. 3. Date and Time of Report—The date and time (161753Z) are depicted in a six-digit group. The first two digits of the six-digit group are the date. The last four digits are the time of the METAR, which is always given in Coordinated Universal Time (UTC). A “Z” is appended to the end of the time to denote the time is given in Zulu time (UTC) as opposed to local time. 4. Modifier—Modifiers denote that the METAR came from an automated source or that the report was corrected. If the notation “AUTO” is listed in the METAR, the report came from an automated source. It also lists “AO1” or “AO2” in the remarks section to indicate the type of precipitation sensors employed at the automated station. When the modifier “COR” is used, it identifies a corrected report sent out to replace an earlier report that contained an error. 5. Wind—Winds are reported with five digits (14021) unless the speed is greater than 99 knots, in which case the wind is reported with six digits. The first three digits indicate the direction the wind is blowing in tens of degrees. If the wind is variable, it is reported as “VRB.” The last two digits indicate the speed of the wind in knots (KT) unless the wind is greater than 99 knots, in which case it is indicated by three digits. If the winds are gusting, the letter “G” follows the windspeed (G26). After the letter “G,” the peak gust recorded is provided. If the wind varies more than 60° and the windspeed is greater than 6 knots, a separate group of numbers, separated by a “V,” will indicate the extremes of the wind directions. 6. Visibility—The prevailing visibility (3/4 SM) is reported in statute miles as denoted by the letters “SM.” It is reported in both miles and fractions of miles. At times, RVR, or runway visual range is reported following the prevailing visibility. RVR is the distance a pilot can see down the runway in a moving aircraft. When RVR is reported, it is shown with an R, then the runway number followed by a slant, then the visual range in feet. For example, when the RVR is reported as R17L/1400FT, it translates to a visual range of 1,400 feet on runway 17 left. 7. Weather—Weather can be broken down into two different categories: qualifiers and weather phenomenon (+TSRA BR). First, the qualifiers of intensity, proximity, and the descriptor of the weather will be given. The intensity may be light (-), moderate ( ), or heavy (+). Proximity only depicts weather phenomena that are in the airport vicinity. The notation “VC” indicates a specific weather phenomenon is in the vicinity of 5 to 10 miles from the airport. Descriptors are used to describe certain types of precipitation and obscurations. Weather phenomena may be reported as being precipitation, obscurations, and other phenomena such as squalls or funnel clouds. Descriptions of weather phenomena as they begin or end, and hailstone size are also listed in the remarks sections of the report. Figure 2: Descriptors and weather phenomena used in a typical METAR. 8. Sky Condition—Sky condition (BKN008 OVC012CB) is always reported in the sequence of amount, height, and type or indefinite ceiling/height (vertical visibility). The heights of the cloud bases are reported with a three-digit number in hundreds of feet above the ground. Clouds above 12,000 feet are not detected or reported by an automated station. The types of clouds, specifically towering cumulus (TCU) or cumulonimbus (CB) clouds, are reported with their height. Contractions are used to describe the amount of cloud coverage and obscuring phenomena. The amount of sky coverage is reported in eighths of the sky from horizon to horizon. Figure 3: Reportable contractions for sky condition. 9. Temperature and Dewpoint—The air temperature and dewpoint are always given in degrees Celsius (18/17). Temperatures below 0°C are preceded by the letter “M” to indicate minus. 10. Altimeter Setting—The altimeter setting is reported as inches of mercury in a four-digit number group (A2970). It is always preceded by the letter “A.” Rising or falling pressure may also be denoted in the remarks sections as “PRESRR” or “PRESFR” respectively. Pilot weather reports provide valuable information regarding the conditions as they actually exist in the air, which cannot be gathered from any other source. Pilots can confirm the height of bases and tops of clouds, locations of wind shear and turbulence, and the location of in-flight icing. If the ceiling is below 5,000 feet, or visibility is at or below 5 miles, ATC facilities are required to solicit PIREPs from pilots in the area. When unexpected weather conditions are encountered, pilots are encouraged to make a report to an FSS or ATC. When a pilot weather report is filed, the ATC facility or FSS will add it to the distribution system to brief other pilots and provide in-flight advisories. PIREPs are easy to file and a standard reporting form outlines the manner in which they should be filed. Figure 4: PIREP encoding and decoding. Figure 4 shows the elements of a PIREP form. Item numbers one through five are required information when making a report, as well as at least one weather phenomenon encountered. PIREPs are normally transmitted as an individual report, but may be appended to a surface report. Pilot reports are easily decoded and most contractions used in the reports are self-explanatory. Areas of precipitation and thunderstorms are observed by radar on a routine basis. Radar weather reports are issued by radar stations at 35 minutes past the hour, with special reports issued as needed. Radar weather reports provide information on the type, intensity, and location of the echo top of the precipitation. Figure 5: Radar weather report codes. These reports may also include direction and speed of the area of precipitation as well as the height and base of the precipitation in hundreds of feet MSL. RAREPs are especially valuable for preflight planning to help avoid areas of severe weather. However, radar only detects objects in the atmosphere that are large enough to be considered precipitation. Cloud bases and tops, ceilings, and visibility are not detected by radar. Location identifier and time of radar observation. 1. Line (LN)—A line of precipitation echoes at least 30 miles long, at least four times as long as it is wide, and at least 25 percent coverage within the line. 2. Area (AREA)—A group of echoes of similar type and not classified as a line. 3. Single Cell (CELL)—A single isolated convective echo such as a rain shower. Type and intensity of weather. Azimuth, referenced to true north, and range, in nautical miles, from the radar site, of points defining the echo pattern. For lines and areas, there will be two azimuth and range sets that define the pattern. For cells, there will be only one azimuth and range set. Dimension of echo pattern—The dimension of an echo pattern is given when the azimuth and range define only the center line of the pattern. Cell movement—Movement is only coded for cells; it will not be coded for lines or areas. Maximum top of precipitation and location. Maximum tops may be coded with the symbols “MT” or “MTS.” If it is coded with “MTS,” it means that satellite data as well as radar information was used to measure the top of the precipitation. If the word “AUTO” appears in the report, it means the report is automated from WSR-88D weather radar data. The last section is primarily used to prepare radar summary charts, but can be used during preflight to determine the maximum precipitation intensity within a specific grid box. The higher the number, the greater the intensity. Two or more numbers appearing after a grid box reference, such as PM34, indicates precipitation in consecutive grid boxes. The radar report gives the following information: The report is automated from Oklahoma City and was made at 1935 UTC. The echo pattern for this radar report indicates a line of echos covering 8/10ths of the area. Observed weather condition reports are often used in the creation of forecasts for the same area. A variety of different forecast products are produced and designed to be used in the preflight planning stage. The printed forecasts that pilots need to be familiar with are the terminal aerodrome forecast (TAF), aviation area forecast (FA), in-flight weather advisories (SIGMET, AIRMET), and the winds and temperatures aloft forecast (FD). A terminal aerodrome forecast is a report established for the 5 statute mile radius around an airport. TAF reports are usually given for larger airports. Each TAF is valid for a 24-hour time period, and is updated four times a day at 0000Z, 0600Z, 1200Z, and 1800Z. The TAF utilizes the same descriptors and abbreviations as used in the METAR report. 1. Type of Report—A TAF can be either a routine forecast (TAF) or an amended forecast (TAF AMD). 2. ICAO Station Identifier—The station identifier is the same as that used in a METAR. 3. Date and Time of Origin—Time and date of TAF origination is given in the six-number code with the first two being the date, the last four being the time. Time is always given in UTC as denoted by the Z following the number group. 4. Valid Period Date and Time—The valid forecast time period is given by a six-digit number group. The first two numbers indicate the date, followed by the two-digit beginning time for the valid period, and the last two digits are the ending time. 5. Forecast Wind—The wind direction and speed forecast are given in a five-digit number group. The first three indicate the direction of the wind in reference to true north. The last two digits state the windspeed in knots as denoted by the letters “KT.” Like the METAR, winds greater than 99 knots are given in three digits. 7. Forecast Significant Weather—Weather phenomenon is coded in the TAF reports in the same format as the METAR. If no significant weather is expected during the forecast time period, the denotation “NSW” will be included in the “becoming” or “temporary” weather groups. 8. Forecast Sky Condition—Forecast sky conditions are given in the same manner as the METAR. Only cumulonimbus (CB) clouds are forecast in this portion of the TAF report as opposed to CBs and towering cumulus in the METAR. 9. Forecast Change Group—For any significant weather change forecast to occur during the TAF time period, the expected conditions and time period are included in this group. This information may be shown as From (FM), Becoming (BECMG), and Temporary (TEMPO). “From” is used when a rapid and significant change, usually within an hour, is expected. “Becoming” is used when a gradual change in the weather is expected over a period of no more than 2 hours. “Temporary” is used for temporary fluctuations of weather, expected to last for less than an hour. 10. Probability Forecast—The probability forecast is given percentage that describes the probability of thunderstorms and precipitation occurring in the coming hours. This forecast is not used for the first 6 hours of the 24-hour forecast. Routine TAF for Pierre, South Dakota…on the 11th day of the month, at 1130Z…valid for 24 hours from 1200Z on the 11th to 1200Z on the 12th …wind from 150° at 12 knots…visibility greater than 6 statute miles…broken clouds at 9,000 feet…temporarily, between 1200Z and 1400Z, visibility 5 statute miles in mist…from 1500Z winds from 160° at 15 knots, gusting to 25 knots visibility greater than 6 statute miles…clouds scattered at 4,000 feet and broken at 25,000 feet…from 0000Z wind from 140° at 12 knots…visibility greater than 6 statute miles…clouds broken at 8,000 feet, overcast at 15,000 feet…between 0000Z and 0400Z, there is 40 percent probability of visibility 3 statute miles… thunderstorm with moderate rain showers…clouds broken at 3,000 feet with cumulonimbus clouds…from 0400Z…winds from 140° at 8 knots…visibility greater than 6 miles…clouds at 4,000 scattered and overcast at 8,000…temporarily between 0400Z and 0800Z… visibility 3 miles… thunderstorms with moderate rain showers…clouds overcast at 3,000 feet with cumulonimbus clouds…becoming between 0800Z and 1000Z…wind from 320° at 7 knots…end of report (=). The aviation area forecast (FA) gives a picture of clouds, general weather conditions, and visual meteorological conditions (VMC) expected over a large area encompassing several states. There are six areas for which area forecasts are published in the contiguous 48 states. Area forecasts are issued three times a day and are valid for 18 hours. This type of forecast gives information vital to en route operations as well as forecast information for smaller airports that do not have terminal forecasts. 1. Header—This gives the location identifier of the source of the FA, the date and time of issuance, the valid forecast time, and the area of coverage. The area forecast shows information given by Dallas Fort Worth, for the region of Oklahoma, Texas, Arkansas, Louisiana, Mississippi, and Alabama, as well as a portion of the gulf coastal waters. It was issued on the 12th day of the month at 0945. The synopsis is valid from the time of issuance until 0400 hours on the 13th. VFR clouds and weather information on this area forecast is valid until 2200 hours on the 12th and the outlook is valid until 0400 hours on the 13th. 2. Precautionary Statements—IFR conditions, mountain obscurations, and thunderstorm hazards are described in this section. Statements made here regarding height are given in MSL, and if given otherwise, AGL or CIG (ceiling) will be noted. SEE AIRMET SIERRA FOR IFR CONDS AND MTN OBSCN. TS IMPLY SEV OR GTR TURB SEV ICE LLWS AND IFR CONDS. NON MSL HGTS DENOTED BYAGL OR CIG. The area forecast covers VFR clouds and weather, so the precautionary statement warns that AIRMET Sierra should be referenced for IFR conditions and mountain obscuration. The code TS indicates the possibility of thunderstorms and implies there may be an occurrence of severe or greater turbulence, severe icing, low-level wind shear, and IFR conditions. The final line of the precautionary statement alerts the user that heights, for the most part, are mean sea level (MSL). Those that are not MSL will be above ground level (AGL) or ceiling (CIG). 3. Synopsis—The synopsis gives a brief summary identifying the location and movement of pressure systems, fronts, and circulation patterns. As of 1000 Zulu, there is a low pressure trough over the Oklahoma and Texas panhandle area, which is forecast to move eastward into central southwestern Oklahoma by 0400 Zulu. A warm front located over central Oklahoma, southern Arkansas, and northern Mississippi at 1000 Zulu is forecast to lift northwestward into northeastern Oklahoma, northern Arkansas, and extreme northern Mississippi by 0400 Zulu. In south central and southeastern Texas, there is a scattered to broken layer of clouds from 1,000 feet AGL with tops at 3,000 feet, visibility is 3 to 5 statute miles in mist. Between 1400 Zulu and 1600 Zulu, the cloud bases are expected to increase to 3,000 feet AGL. After 1900 Zulu, the cloud bases are expected to continue to increase to 5,000 feet AGL and the outlook is VFR. In northwestern Oklahoma and panhandle, the clouds are scattered at 3,000 feet with another scattered to broken layer at 10,000 feet AGL, with the tops at 20,000 feet. At 1500 Zulu, the lowest cloud base is expected to increase to 4,000 feet AGL with a scattered layer at 10,000 feet AGL. After 2000 Zulu, the forecast calls for scattered thunderstorms with rain developing and a few becoming severe; the cumulonimbus clouds will have tops at flight level 450 or 45,000 feet MSL. It should be noted that when information is given in the area forecast, locations may be given by states, regions, or specific geological features such as mountain ranges. Figure 6 shows an area forecast chart with six regions of forecast, states, regional areas, and common geographical features. Figure 6: Area forecast region map. In-flight weather advisories, which are provided to en route aircraft, are forecasts that detail potentially hazardous weather. These advisories are also available to pilots prior to departure for flight planning purposes. An in-flight weather advisory is issued in the form of either an AIRMET, SIGMET, or Convective SIGMET. AIRMETs (WAs) are examples of in-flight weather advisories that are issued every 6 hours with intermediate updates issued as needed for a particular area forecast region. The information contained in an AIRMET is of operational interest to all aircraft, but the weather section concerns phenomena considered potentially hazardous to light aircraft and aircraft with limited operational capabilities. An AIRMET includes forecast of moderate icing, moderate turbulence, sustained surface winds of 30 knots or greater, widespread areas of ceilings less than 1,000 feet and/or visibilities less than 3 miles, and extensive mountain obscurement. Each AIRMET bulletin has a fixed alphanumeric designator, numbered sequentially for easy identification, beginning with the first issuance of the day. SIERRA is the AIRMET code used to denote instrument flight rules (IFR) and mountain obscuration; TANGO is used to denote turbulence, strong surface winds, and low-level wind shear; and ZULU is used to denote icing and freezing levels. This AIRMET was issued by Dallas Fort Worth on the 24th day of the month, at 1650 Zulu time. On this third update, the AIRMET Tango is issued for turbulence, strong surface winds, and low-level wind shear until 2000 Zulu on the same day. The turbulence section of the AIRMET is an update for Oklahoma and Texas. It defines an area from Oklahoma City to Dallas, Texas, to San Antonio, to Midland, Texas, to Childress, Texas, to Oklahoma City that will experience occasional moderate turbulence below 6,000 feet due to strong and gusty low-level winds. It also notes that these conditions are forecast to continue beyond 2000 Zulu. SIGMETs (WSs) are in-flight advisories concerning non-convective weather that is potentially hazardous to all aircraft. They report weather forecasts that include severe icing not associated with thunderstorms, severe or extreme turbulence or clear air turbulence (CAT) not associated with thunderstorms, dust storms or sandstorms that lower surface or in-flight visibilities to below 3 miles, and volcanic ash. SIGMETs are unscheduled forecasts that are valid for 4 hours, but if the SIGMET relates to hurricanes, it is valid for 6 hours. A SIGMET is issued under an alphabetic identifier, from November through Yankee, excluding Sierra and Tango. The first issuance of a SIGMET is designated as a UWS, or Urgent Weather SIGMET. Re-issued SIGMETs for the same weather phenomenon are sequentially numbered until the weather phenomenon ends. SFOR WS 100130 SIGMET ROME02 VALID UNTIL 100530 OR WA FROM SEA TO PDT TO EUG TO SEA OCNL MOGR CAT BTN 280 AND 350 EXPCD DUE TO JTSTR. CONDS BGNG AFT 0200Z CONTG BYD 0530Z . This is SIGMET Romeo 2, the second issuance for this weather phenomenon. It is valid until the 10th day of the month at 0530 Zulu time. This SIGMET is for Oregon and Washington, for a defined area from Seattle to Portland to Eugene to Seattle. It calls for occasional moderate or greater clear air turbulence between 28,000 and 35,000 feet due to the location of the jetstream. These conditions will be beginning after 0200 Zulu and will continue beyond the forecast scope of this SIGMET of 0530 Zulu. A Convective SIGMET (WST) is an in-flight weather advisory issued for hazardous convective weather that affects the safety of every flight. Convective SIGMETs are issued for severe thunderstorms with surface winds greater than 50 knots, hail at the surface greater than or equal to 3/4 inch in diameter, or tornadoes. They are also issued to advise pilots of embedded thunderstorms, lines of thunderstorms, or thunderstorms with heavy or greater precipitation that affect 40 percent or more of a 3,000 square foot or greater region. Convective SIGMETs are issued for each area of the contiguous 48 states but not Alaska or Hawaii. This Convective SIGMET provides the following information: The WST indicates this report is a Convective SIGMET. The current date is the 22nd of the month and it was issued at 1855 Zulu. It is Convective SIGMET number 21C, indicating that it is the 21st consecutive report issued for the central United States. This report is valid for 2 hours until 2055 Zulu time. The Convective SIGMET is for an area from Kansas to Oklahoma to Texas, in the vicinity of a line from Goodland, Kansas, to Childress, Texas. No significant thunderstorms are being reported, but a line of thunderstorms will develop by 1955 Zulu time and will move eastward at a rate of 30-35 knots through 2055 Zulu. Hail up to 2 inches in size is possible with the developing thunderstorms. Winds and temperatures aloft forecasts provide wind and temperature forecasts for specific locations in the contiguous United States, including network locations in Hawaii and Alaska. The forecasts are made twice a day based on the radiosonde upper air observations taken at 0000Z and 1200Z. Through 12,000 feet are true altitudes and above 18,000 feet are pressure altitudes. Wind direction is always in reference to true north and windspeed is given in knots. The temperature is given in degrees Celsius. No winds are forecast when a given level is within 1,500 feet of the station elevation. Similarly, temperatures are not forecast for any station within 2,500 feet of the station elevation. If the windspeed is forecast to be greater than 100 knots but less than 199 knots, the computer adds 50 to the direction and subtracts 100 from the speed. To decode this type of data group, the reverse must be accomplished. For example, when the data appears as “731960,” subtract 50 from the 73 and add 100 to the 19, and the wind would be 230° at 119 knots with a temperature of –60°C. If the windspeed is forecast to be 200 knots or greater, the wind group is coded as 99 knots. For example, when the data appears as “7799,” subtract 50 from 77 and add 100 to 99, and the wind is 270° at 199 knots or greater. When the forecast windspeed is calm or less than 5 knots, the data group is coded “9900,” which means light and variable. Figure 7: Winds and temperatures aloft forecast. The heading indicates that this FD was transmitted on the 15th of the month at 1640Z and is based on the 1200 Zulu radiosonde. The valid time is 1800 Zulu on the same day and should be used for the period between 1700Z and 2100Z. The heading also indicates that the temperatures above 24,000 feet MSL are negative. Since the temperatures above 24,000 feet are negative, the minus sign is omitted. A 4-digit data group shows the wind direction in reference to true north, and the windspeed in knots. The elevation at Amarillo, TX (AMA) is 3,605 feet, so the lowest reportable altitude is 6,000 feet for the forecast winds. In this case, “2714” means the wind is forecast to be from 270° at a speed of 14 knots. A 6-digit group includes the forecast temperature aloft. The elevation at Denver (DEN) is 5,431 feet, so the lowest reportable altitude is 9,000 feet for the winds and temperature forecast. In this case, “2321-04” indicates the wind is forecast to be from 230° at a speed of 21 knots with a temperature of –4°C. Weather charts are graphic charts that depict current or forecast weather. They provide an overall picture of the United States and should be used in the beginning stages of flight planning. Typically, weather charts show the movement of major weather systems and fronts. Surface analysis, weather depiction, and radar summary charts are sources of current weather information. Significant weather prognostic charts provide an overall forecast weather picture. The surface analysis chart, depicts an analysis of the current surface weather. Figure 8: Surface analysis chart. This chart is a computer prepared report that is transmitted every 3 hours and covers the contiguous 48 states and adjacent areas. A surface analysis chart shows the areas of high and low pressure, fronts, temperatures, dewpoints, wind directions and speeds, local weather, and visual obstructions. Surface weather observations for reporting points across the United States are also depicted on this chart. Each of these reporting points is illustrated by a station model. Figure 9: Sample station model and weather chart symbols. Type of Observation—A round model indicates an official weather observer made the observation. A square model indicates the observation is from an automated station. Stations located offshore give data from ships, buoys, or offshore platforms. Sky Cover—The station model depicts total sky cover and will be shown as clear, scattered, broken, overcast, or obscured/partially obscured. Clouds—Cloud types are represented by specific symbols. Low cloud symbols are placed beneath the station model, while middle and high cloud symbols are placed directly above the station model. Typically, only one type of cloud will be depicted with the station model. Sea Level Pressure—Sea level pressure given in three digits to the nearest tenth of a millibar. For 1000 mbs or greater, prefix a 10 to the three digits. For less than 1000 mbs, prefix a 9 to the three digits. Pressure Change/Tendency—Pressure change in tenths of millibars over the past 3 hours. This is depicted directly below the sea level pressure. Precipitation—A record of the precipitation that has fallen over the last 6 hours to the nearest hundredth of an inch. Dewpoint—Dewpoint is given in degrees Fahrenheit. Present Weather—Over 100 different weather symbols are used to describe the current weather. Temperature—Temperature is given in degrees Fahrenheit. Wind—True direction of wind is given by the wind pointer line, indicating the direction from which the wind is coming. A short barb is equal to 5 knots of wind, a long barb is equal to 10 knots of wind, and a pennant is equal to 50 knots. A weather depiction chart details surface conditions as derived from METAR and other surface observations. The weather depiction chart is prepared and transmitted by computer every 3 hours beginning at 0100 Zulu time, and is valid at the time of the plotted data. It is designed to be used for flight planning by giving an overall picture of the weather across the United States. Figure 10: Weather depiction chart. This type of chart typically displays major fronts or areas of high and low pressure. The weather depiction chart also provides a graphic display of IFR, VFR, and MVFR (marginal VFR) weather. Areas of IFR conditions (ceilings less than 1,000 feet and visibility less than 3 miles) are shown by a hatched area outlined by a smooth line. MVFR regions (ceilings 1,000 to 3,000 feet, visibility 3 to 5 miles) are shown by a non-hatched area outlined by a smooth line. Areas of VFR (no ceiling or ceiling greater than 3,000 feet and visibility greater than 5 miles) are not outlined. 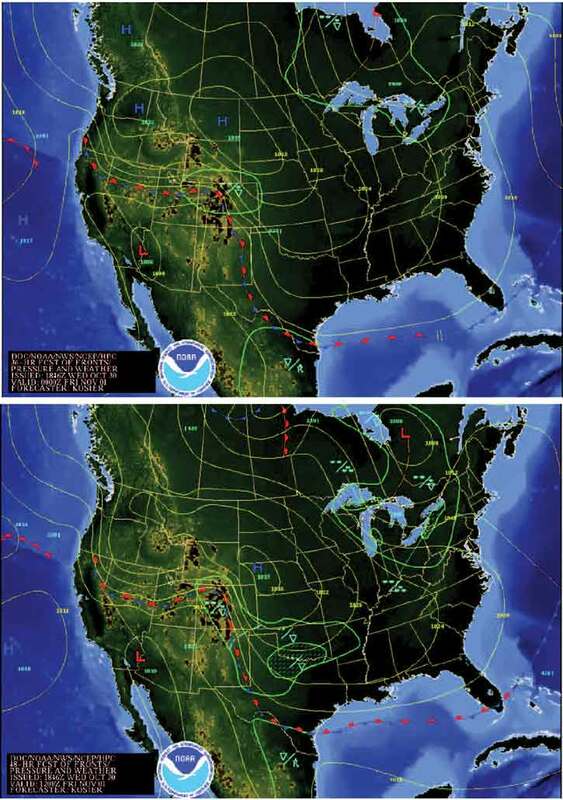 Weather depiction charts show a modified station model that provides sky conditions in the form of total sky cover, cloud height or ceiling, weather, and obstructions to visibility, but does not include winds or pressure readings like the surface analysis chart. A bracket ( ] ) symbol to the right of the station indicates the observation was made by an automated station. A detailed explanation of a station model is depicted in the previous discussion of surface analysis charts. A radar summary chart is a graphically depicted collection of radar weather reports (SDs). Figure 11: Radar summary chart. The chart is published hourly at 35 minutes past the hour. It displays areas of precipitation as well as information regarding the characteristics of the precipitation. Figure 12: Intensity levels and contours, and precipitation type symbols. Precipitation intensity contours—Intensity can be described as one of six levels and is shown on the chart by three contour intervals. Height of tops—The heights of the echo tops are given in hundreds of feet MSL. Movement of cells—Individual cell movement is indicated by an arrow pointing in the direction of movement. The speed of movement in knots is the number at the top of the arrow head. “LM” indicates little movement. Type of precipitation—The type of precipitation is marked on the chart using specific symbols. These symbols are not the same as used on the METAR charts. Echo configuration—Echoes are shown as being areas, cells, or lines. Weather watches—Severe weather watch areas for tornadoes and severe thunderstorms are depicted by boxes outlined with heavy dashed lines. The radar summary chart is a valuable tool for preflight planning. It does, however, contain several limitations for the usage of the chart. This chart depicts only areas of precipitation. It will not show areas of clouds and fog with no appreciable precipitation, or the height of the tops and bases of the clouds. Radar summary charts are a depiction of current precipitation and should be used in conjunction with current METAR and weather forecasts. Significant Weather Prognostic Charts are available for low-level significant weather from the surface to FL240 (24,000 feet), also referred to as the 400 millibar level, and high-level significant weather from FL250 to FL600 (25,000 to 60,000 feet). The primary concern of this discussion is the low-level significant weather prognostic chart. The low-level chart comes in two forms: the 12- and 24-hour forecast chart, and the 36 and 48 surface only forecast chart. The first chart is a four-panel chart that includes 12- and 24-hour forecasts for significant weather and surface weather. Charts are issued four times a day at 0000Z, 0600Z, 1200Z, and 1800Z. The valid time for the chart is printed on the lower left-hand corner of each panel. The upper two panels show forecast significant weather, which may include nonconvective turbulence, freezing levels, and IFR or MVFR weather. Areas of moderate or greater turbulence are enclosed in dashed lines. Numbers within these areas give the height of the turbulence in hundreds of feet MSL. Figures below the line show the anticipated base, while figures above the line show the top of the zone of turbulence. Also shown on this panel are areas of VFR, IFR, and MVFR. IFR areas are enclosed by solid lines, MVFR areas are enclosed by scalloped lines, and the remaining, unenclosed area is designated VFR. Zigzag lines and the letters “SFC” indicate freezing levels in that area are at the surface. Freezing level height contours for the highest freezing level are drawn at 4,000-foot intervals with dashed lines. The lower two panels show the forecast surface weather and depicts the forecast locations and characteristics of pressure systems, fronts, and precipitation. Standard symbols are used to show fronts and pressure centers. Direction of movement of the pressure center is depicted by an arrow. The speed, in knots, is shown next to the arrow. In addition, areas of forecast precipitation and thunderstorms are outlined. Areas of precipitation that are shaded indicate at least one-half of the area is being affected by the precipitation. Unique symbols indicate the type of precipitation and the manner in which it occurs. Figure 13: Significant weather prognostic chart. Figure 13 depicts a typical significant weather prognostic chart as well as the symbols typically used to depict precipitation. Prognostic charts are an excellent source of information for preflight planning; however, this chart should be viewed in light of current conditions and specific local area forecasts. The 36- and 48-hour significant weather prognostic chart is an extension of the 12- and 24-hour forecast. It provides information regarding only surface weather forecasts and includes a discussion of the forecast. This chart is issued only two times a day. It typically contains forecast positions and characteristics of pressure patterns, fronts, and precipitation. An example of a 36- and 48-hour surface prognostic chart is shown in figure 14. Figure 14: 36- and 48-hour surface prognostic chart. This concludes the aviation weather reporting page. You can now go on to the Navigation Basics page or test your knowledge at the FAA Aviation Weather test question bank.